Rasheed Sulaimon report: Coach Mike Krzyzewski and Duke officials knew about sexual assault allegations against player months before dismissal. Duke University officials, including legendary basketball coach Mike Krzyzewski, were reportedly aware of multiple sexual assault allegations against guard Rasheed Sulaimon for nearly a year before dismissing him from the team in January, the Duke Chronicle reported Monday. Two female students alleged at separate student-led diversity retreats during the 2013–14 school year that Sulaimon had assaulted them, but both students decided not to pursue criminal or disciplinary charges against Sulaimon, partly out of fear of a backlash by Duke fans, the Chronicle reports. 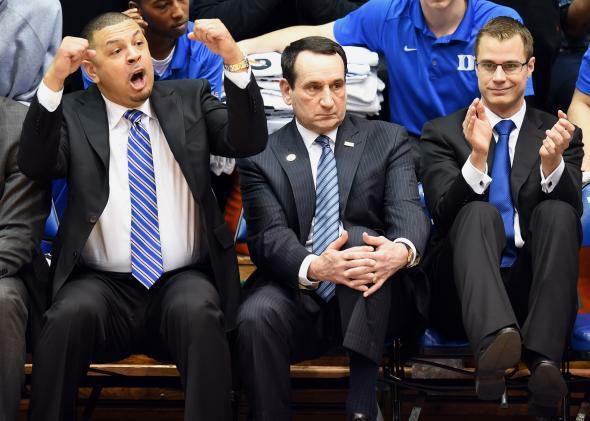 A former team affiliate told the newspaper that Duke’s team psychologist, two assistant coaches, associate head coach Jeff Capel, and Krzyzewski were informed of the allegations last March. The affiliate, who was granted anonymity by the Chronicle, said that athletic department officials and at least one dean were also made aware of the charges. Even when students don’t file complaints, universities are required by Title IX to investigate allegations of sexual assault. The school said that it takes these steps when necessary, but declined to comment on the individual case of Sulaimon. “Duke takes immediate action when a student reports allegations of sexual misconduct or other violations of the student conduct code,” the university said in a statement to the newspaper. A week before Sulaimon was dismissed, a secretary in the Duke basketball office and university senior resigned from his job after informing an administrative assistant that he knew of the allegations. The former secretary told the Chronicle he was later informed that Krzyzewski and school vice president and director of athletics, Kevin White, were aware of the accusations. On Jan. 29, Sulaimon became the first player in Krzyzewski’s 35-year Duke head coaching tenure to be dismissed from the team. He had a standout freshman season, scoring 11.6 points per game, but his statistics have regressed in the past two seasons.